My 12 year old was the reader of this book. <img src="http://lh4.ggpht.com/-dil3JSdq6Ak/UmV5WXUFnDI/AAAAAAAAJfo/TyTbNinEuwk/videod6ce7aad5cc9%25255B6%25255D.jpg?imgmax=800" style="border-style: none" galleryimg="no" onload="var downlevelDiv = document.getElementById('42776a61-b0f1-460a-ab99-74f69ea417cf'); downlevelDiv.innerHTML = "
<img src="http://lh5.ggpht.com/-Eke9anYT9R4/UmV5XSny8iI/AAAAAAAAJfw/avNWgKcMzp8/video3b0a1138e445%25255B4%25255D.jpg?imgmax=800" style="border-style: none" galleryimg="no" onload="var downlevelDiv = document.getElementById('ef38f2dc-7be2-4c34-8c06-a644e6c18323'); downlevelDiv.innerHTML = "
It was cool to see how someone could live without arms and legs. Seeing how he is able to live a normal life was inspiring. Listening to how he describes overcoming difficulties was very powerful. He reminds you that it will usually take more than you have to overcome and yet you need to have faith. Nick’s testimony has affected the lives of so many other people. There were some people who were crippled and they were inspired by how he was dealing with his life, and they would realize that they could overcome what they were facing too. Many people who were just in a bad place (without a job, depressed, etc) saw his courage to face life, especially without limbs, and they were able to get themselves back to a better place by pushing through. I also read through most of the book and loved it. It is a highly inspiring story that will encourage your heart on many levels. 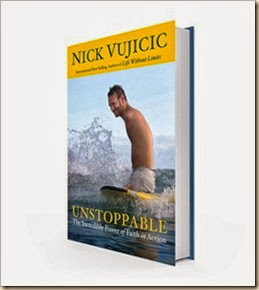 This book will pull anyone out of a dark place, seeing how much Nick loves life, simply makes you want to go out and make the most of what you have! I love his humor, his jokes and his honesty. I enjoy his stories woven throughout his book that will explain what he has faced and how he made it through. What I love most though, is the way Nick loves the Lord and shares his passion of sharing that love with others. Seeing how he has trusted the Lord through his life inspires and reminds me to trust him with everything. This is a great book for anyone to read, even young adults – helps them to see life a bit beyond their own lives. Would make a great gift for the upcoming Christmas Season!! NOTE : I was offered a copy of this book in exchange for an honest review by Waterbrook Multnomah, in exchange for an honest review. Previous Growing up … ugh!